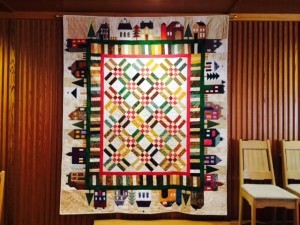 Harcourt’s Quilting Group has been meeting for the past 10 years. It began with former minister Monica Moore’s encouragement. All of our quilts are machine made and either donated to folks in need or used for fundraising projects. Though small in number, we are an industrious group and have produced scores of quilts over the years. Four quilts made from donated African fabrics, in conjunction with the Guelph Cares Day event, which were used by the Guelph AIDS Committee to raise funds for AIDS patients’ care at the Tsepong Clinic in Lesotho. Several quilts sent to Haiti. Quilts for refugee families sponsored by Harcourt and Dublin United Church. Dozens of quilts sent to Red Lake with the annual Mitten Tree donations. Several fundraising quilts for the Holly’s Heart events. Rainbow altar cloth and matching pulpit hanging. Silk stole decorated with fabric pieces from the Rainbow altar cloth as going away gift for Monica Moore. “Two-toonie Totes” sold to raise funds for Chalmers Community Services Centre and to replenish supplies for the quilt group to continue. Christmas place mats donated to Meals on Wheels. 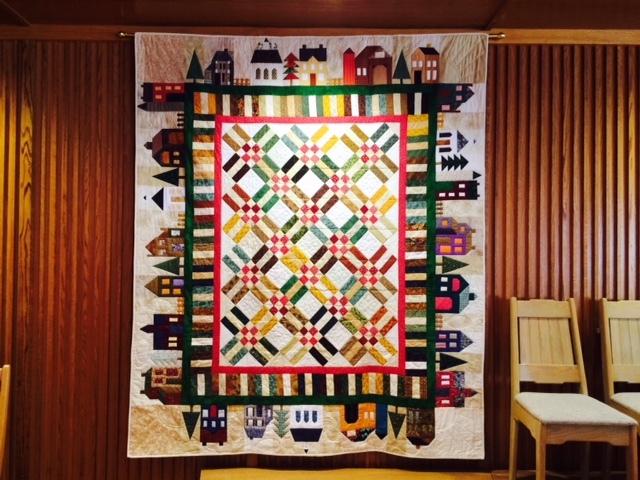 The “It Takes A Village” quilt was used to raise funds for two educational projects in Uganda. Currently the Quilting Group meets the fourth Monday each month from September to June. We welcome experienced quilters to join our group. Contact: Jill Gill. 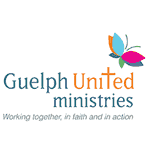 In 2019 the group will be creating quilts to donate to young adults who are leaving foster care, through Carolyn Tait-Guest (Development Coordinator with Family and Children’s Services-Guelph/Wellington).